Today my wife Val retired from her job as accountant with the South African Medical Association (SAMA), after a long and varied career. She probably won’t write about it, but I think it’s worth recording as part of our family history, and she can add to it or correct it later. When I first met Val in 1972 she was working as a bookkeeper for the Stafford Mayer company in Durban, mainly looking after their pension fund, so my knowledge of her career before then was hearsay only. She attended high school at Pinetown Convent, and when she left the nuns wanted her to do maths, but she was only interested in accounting (she has the calculating mind in the family) and she went to the Natal Technical College for a year, and then started work. I know she worked for Clover Dairies, and for the distributors of Mercedes Benz cars, but I’m not sure for how long. After we were married she continued to work at Stafford Mayer, which was taken over by a big company, and then she worked for another subsidiary, SA Board Mills, for a few months, and resigned when we went to live in Utrecht in September 1976. 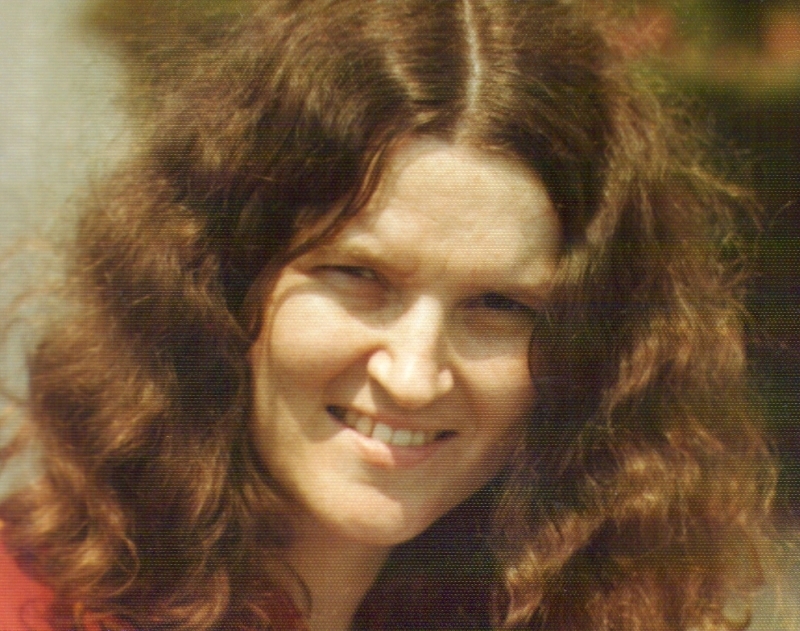 Val Hayes in 1978, when we were living in Melmoth, Zululand, and she was running the Diocese of Zululand book store. In 1977 we went to Melmoth, were I was to be Director of Training for Ministries for the Anglican Diocese of Zululand. There was a part-time bookkeeper-secretary, Edna Cooke, looking after the the books of the Christian Education and Training for Ministries departments, and when Edna moved to Johannesburg Val took over, and developed the diocesan book agency, selling books at most events that took place at the diocesan conference centre at KwaNzimela, 10km away. Most of the clergy bought quite a lot of books, and we hoped to encourage the habit of reading. Val used the profits to buy more stock, so we were able to offer a larger variety of books as time went on. At the end of 1982 we moved again, this time to Verwoerdburg, which is now Centurion and part of the City of Tshwane. I was to be Director of Mission and Evangelism for the Anglican Diocese of Pretoria. Our children were ready to start school, and were offered places in the local Anglican church schools, where Val drove them to school each day. She was offered a job as assistant to the bookkeeper at St Mary’s Diocesan School for Girls, where our daughter had just started Grade I. It didn’t pay very much, but not having to travel twice a day to tke the children and fetch them again was a saving in itself. The idea was that when the bookkeeper retired Val would take over. But then a new headmaster appeared on the scene, darkly muttering the then-fashionable mantra “excellence”, and it seemed that our family did not fit his criteria for “excellence”, and Val left at the end of 1987, and began looking for a full-time job, not sure that it would be too easy to find one after not having worked full time for 12 years, and also with computerised bookkeeping beginning to make its appearance, which Val had no experience of. But Val got a job with Galvadip, a galvanising firm in Waltloo — a much better-paid and more responsible job than the DSG one. 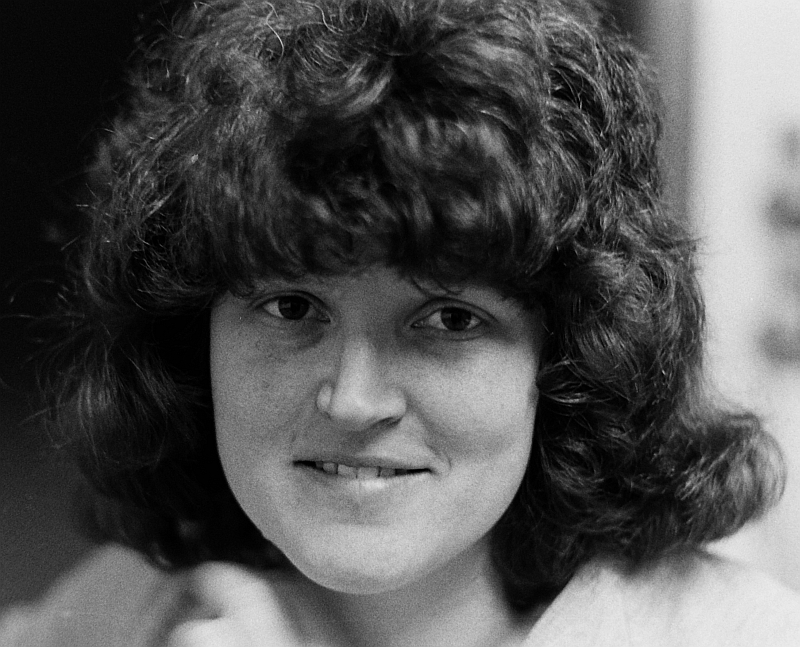 She bought a computer and taught herself to use spreadsheets, and began to computerise the books of the company. After a year, however, there were some ethical problems, and she began to look for another job. On 2 May 1989 Val started working for Wormald, the fire protection engineers. It was an international company, based in Australia. They used the Accpac accounting system, which Val learned, and became something of a fundi in. But that was also the time when overseas firms were disinvesting in South Africa, and the South African branch of Wormald decided to go it alone, and became Republic Automatic Sprinklers (Rasco), and did not prosper as much as they had hoped. After working there for five years, Val left at the end of September 1994. Val also used the experience she had gained of running a church book store in Zululand to run an Orthodox book store in Johannesburg for the Orthodox Society of St Nicholas of Japan. She took over the running of it with R600.00 worth of stock, and by the time we had to close it in 1999 the stock was worth more than R40000.oo. Her next job was with Levenstein’s, which were an accounting firm, and her job was to travel around to the various clients with a laptop computer, troubleshooting their accounting problems. That entailed buying a new car, and after comparing fuel consumption figures, and testing how well our growing children fitted into the back seat of various models, we bought a Mazda 323 Sting, because Val had to travel to the office in Johannesburg every day. But that proved to be a problem. The new democratic South Africa had nine provinces instead of the old four, and the capital of Gauteng (then called PWV) was moved to Johannesburg. That meant that civil servants who had previously worked at the Transvaal Provincial Administration in Pretoria were now also on the road to Johannesburg at the same time, and the newly enlarged freeway was unable to cope. It was stop-go traffic all the way, 70 km each day, five days a week. Then a bloke at Applico, who were agents for Accpac software, offered Val a job as a teacher/troubleshooter for Accpac users, and she worked there for a few months, but found it a bit frustrating. She preferred to be in control of her own set of books, and in June 1995 she started working at Echo Prestress Concrete at Cloorkop. It was only half the distance she had had to travel to Levenstein’s in Berea, Johannesburg, but it was still a long drive in heavy traffic, so she began looking for a job closer to home again. She got a job as a kind of assistant to the financial manager of a security firm, Astron-Bexforce. They installed and monitored burglar alarms and provided security guards and things like that. It seemed that with the coming of the democratic South Africa there was no need for a large standing army, and so lots of ex-soldiers and their dogs set up security firms, which worked fine until they had more clients than they could handle and the administration got too much for them. So they began to amalgamate, and Val’s job was to integrate the books and accounting systems of the smaller firms that were taken over. Then Astron-Bexforce was itself taken over by Sentry Security (which had itself started as a small neighbourhood security operation called Sandton Sentry). The financial manager of the Pretoria branch left, and Val applied for, and got, his job. That meant working long hours, and running the whole Pretoria accounting office, and it continued growing. Then Sentry Security was itself taken over by an overseas firm, Tyco, which was the British arm of an American company, ADT. The work load increased even more, because the American headquarters wanted timely reporting, which meant that the British branch had a deadline, and the South Africans had an even tighter deadline to meet the British deadline. But they were reluctant to employ new staff to meet these requirements. Eventually they decided to centralise things at the head office in Johannesburg, and Val had to move there, and travel 50km each way again — the very thing that she had hoped to avoid by taking the job in the first place. 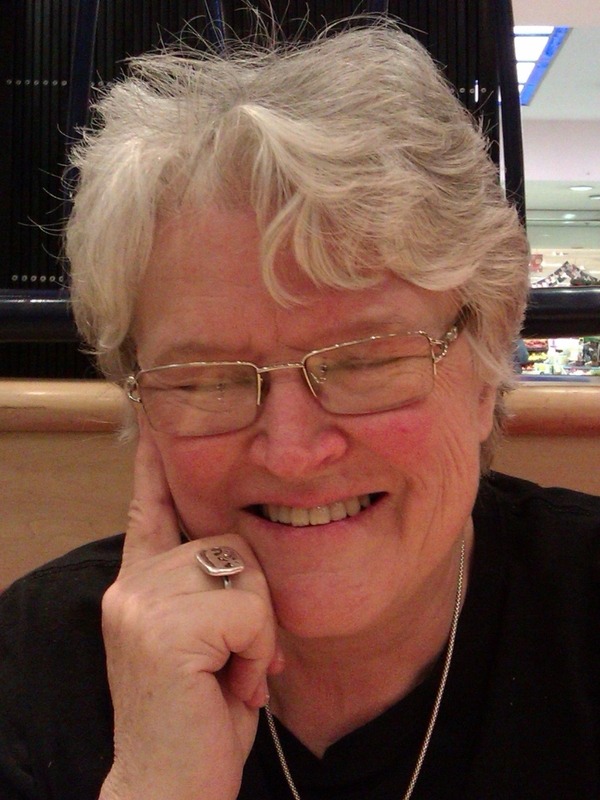 Val Hayes, on her 65th birthday (25 Nov 2013). She planned to retire at the end of the month, but SAMA asked her to stay on until the financial year end. So Val left ADT at the end of July 2006 and found another job, closer to home, with a start-up company called Telezero. It was at much lower pay, but Val reckoned that if she carried on with ADT until she retired she would have spent a year of her life sitting in traffic jams. Telezero sold international telephone cards, and it had grown so rapidly that the guy who ran it had lost track of who owed him money, and wanted Val to set up the books for him properly. She did, but she not only gave him the welcome news of how much money people owed him, but also the unwelcome news of how much he owed to the tax people, in VAT, employees tax and more. So she left after barely six months, as did most of the rest of the staff. 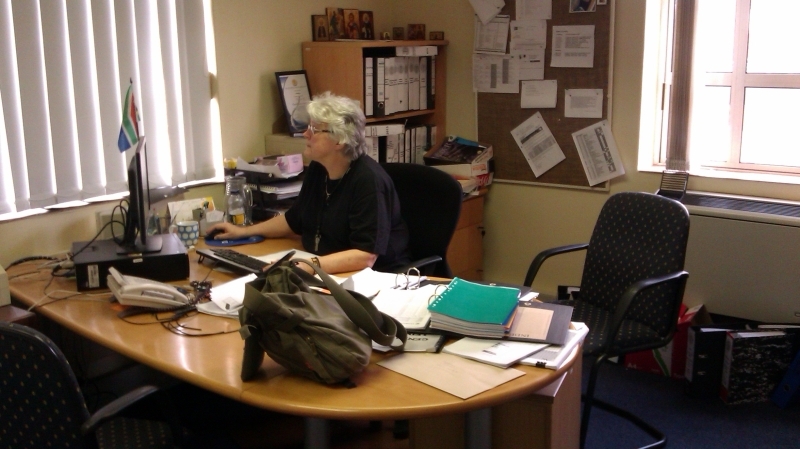 And so in April 2007 she started working at the South African Medical Association, as her last full-time job, and retires from there today. We’re looking forward to having more time together.